A compact and highly competent inkjet all in one, that's the Epson Stylus Dx3850. It is meant to be a lack of all trades without being the master of any one function in particular. With print resolutions of 5760 x 1440 dpi in both mono and colour mode, Epson Stylus Dx3850 gives good print results. The speeds are up to 18 ppm for black and 9 ppm for colour printouts. The Epson Stylus Dx3850 ink cartridges help give this printer a reasonably low cost of operations and same can be further lowered with compatible cartridges. The scanner comes with a 600x600 dpi resolution and with copying speeds of up to 12 ppm. Connectivity is only through USB which severely limits its functionality. It is a compact and lightweight unit with the feeder tray capable of handling upto 100 pages. The individual Epson Stylus Dx3850 ink cartridges can be replaced for each colour, helping to reduce its cost and also aiding in ease of use. 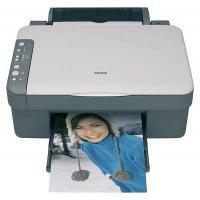 Borderless prints enhance photo printouts and give good quality outputs. The complete suite of Epson software further enhances its use with software that help in enhancing photos, editing images, automatically converting scans into text and more. The special Epson DURABrite Ultra Ink further enhances results when printing glossy photos. Epson Stylus Dx3850 is a typical all in one that does not disappoint at anything but does not delight in any particular aspect either. It is good for home and small offices and will be a reasonable buy with low operating costs. Its lack of connectivity decreases its usage in larger offices. Q. How should i replace the empty ink cartridges of my Epson Stylus Dx3850 printer? Step1: Make sure the On light is on, but not flashing. Step2: Make sure that the document cover is closed, and then open the scanner unit. Caution: Do not open the scanner unit when the document cover is still open. Step3: Press the ink button. The print head moves to the ink cartridge check position and the On light and the Ink light begins to flash. The ink cartridge indicated by the mark is either empty or low. Note: If an ink cartridge is low, you may continue to use it until it is empty. To confirm the level of ink remaining in each cartridge, see the following sections: See Using EPSON Status Monitor 3 (Windows). Caution: Do not move the print head by hand, as this may damage this printer. Always press the Ink button to move it. Step4: Press the ink button again. If more than one ink cartridge is empty or low, the print head moves to the mark. This occurs each time you press the ink button until all empty or low ink cartridges have been indicated. Once all of the empty or low ink cartridges have been indicated, the print head moves to the ink cartridge replacement position when you press the ink button. Step5: For best results, shake the ink cartridge four or five times before opening the package. Step6: Remove the new ink cartridge from the package. Caution: Be careful not to break the hooks on the side of the Epson Stylus Dx3850 ink cartridges when you remove it from the package. Always install an ink cartridge immediately after removing the old cartridge. If the cartridge is not installed promptly, the print head may dry out and be unable to print. Step7: Open the cartridge cover. Squeeze the tab at the back of the ink cartridge that you want to replace. Lift the cartridge out of this printer and dispose of it properly. Do not take the used cartridge apart or try to refill it. Step8: Place the Epson Stylus Dx3850 ink cartridges into the cartridge holder. Then push down the ink cartridge until it clicks into place. Step9: When you have finished replacing the ink cartridge, close the cartridge cover and press it so that it clicks into place. then close scanner unit. Step10: Press the Ink button. The printer moves the print head and begins charging the ink delivery system. This process takes about one minute to complete. When ink charging is finished, the print head returns to its home position. The On light stop flashing and remains on, and the ink light goes out. Q. How do I print borderless images with my Epson Stylus DX3850 printer on my Windows PC? Go to the main tab and set the quality settings to either “Photo” or “Best Photo”. Select the appropriate paper type and paper size. Tick the “Borderless” check box. Select the orientation of your printout. Click “OK” to exit the printer driver window. Q. I have noticed that compatible Epson Stylus DX3850 ink cartridges are comparatively cheaper as compared to the original ones. Does this mean that I will also have to compromise on quality when using the compatible ink cartridges? A. All our compatible ink cartridges are of high quality, that have been factory tested and certified. They are designed to produce the same quality output as the original ink cartridges. Therefore, you do not need to worry about compromising on print quality when using our compatible ink cartridges. Q. How many pages is it possible to print with the Epson Stylus DX3850 printer in one print job? A. Epson Stylus DX3850 printers can handle up to 100 pages in their feeder tray. This means you can print up to 100 pages in a single print job. Q. I have run out of magenta ink for my Epson Stylus DX3850. Do you provide magenta Epson Stylus DX3850 ink cartridges individually or will I have to buy all the colours together? A. Yes, we provide individual Epson Stylus DX3850 ink cartridges of all colours. Our customers are given a choice whether to buy the ink cartridges individually, so that they can replace only the colour that has run out, or to buy them in multipacks which contain all the colours. Q. Is there any difference in the ink volume in your compatible Epson Stylus DX3850 ink cartridges and the original ink cartridges? A. Yes, our compatible ink cartridges have an ink volume of 12 ml each whereas the original Epson Stylus DX3850 ink cartridges contain 8 ml of ink. Q. Can I use my Windows XP driver in Vista? A. Yes, you can use the XP driver in place of the Vista driver, if no driver is available for your product. If a user attempts to use the XP version of a driver, a simple orange UAC warning will occur during the install on a Vista PC but there should not be any serious problem. Clicking ‘Allow’ will enable the installation. Q. How do I install my Epson Stylus Dx3850 ink cartridges for the first time? Firstly, lower the printer's output tray and open the top cover. Now connect the power cable to the printer and switch on the printer. Lift up the ink cartridge clamps. Shake the new ink cartridge package four or five times before you open it. Then remove it from the package. Remove the yellow tape from the bottom of the ink cartridge. And place it into the cartridge holder with the bottom down. Further, push down the Epson Stylus Dx3850 ink cartridge until it clicks into place. Close the ink cartridge cover and press it until it clicks into place. Press the ink or start button to begin charging the system after closing the printer cover. Keep in mind that while the ink system is charging do not switch off the printer. Q. The printer sounds like it is printing but there is no ink on paper. What is wrong with my printer? A. The probable reason for this is that the print head nozzles may be clogged. You must clean the printheads by performing a head cleaning followed by printing a nozzle check pattern. A head cleaning and nozzle check should be performed as a cycle. After this, examine the printed dot pattern to see if there is any improvement. It is advised that you perform up to four cycles. Try replacing the Epson Stylus Dx3850 ink cartridges, if nothing helps. Q. Are Epson Stylus Dx3850 ink cartridges environment-friendly? A. Yes, they are. These Epson ink cartridges are composed of high quality new and remanufactured materials. They use more of eco-friendly substances, need lesser energy, water and raw materials to be created and also don’t emit toxic waste much. Q. I tried installing multiple cartridges for Epson Stylus Dx3850 printer but they are being rejected. What shall I do? A. You need to reinstall all the cartridges separately and ensure that each cartridge is recognised by the printer before inserting the next cartridge. Q. Does turning off the PhotoEnhance function help if printouts aren’t coming out good? A. Yes. Try doing that and then print. You’ll notice the difference. Q. I performed the nozzle check process on the Epson Stylus Dx3850 printer I have. It isn’t printing completely and the head cleaning I carried out also isn’t helping the nozzle check pattern to print completely. Should I replace the Epson Stylus Dx3850 ink cartridges? A. Yes, since both the steps didn’t work, it indicates that you need to replace the Epson Stylus Dx3850 ink cartridges. Q. If the copper contact plate on ink cartridges isn’t clean, what problems can one encounter? A. The copper contact plate on any cartridge has to be free of dust, fingerprints or any marks as it’s a sensitive component. Any kind of dirt can hamper the printer from functioning normally. To clean the copper plate on the cartridge, first switch your printer off and then remove the cartridge from it. Take a piece of wet kitchen roll, wipe the copper plate on the cartridge gently. Let the chip dry and then put the cartridge back into the printer. You can switch the printer on on after about 20 minutes. Q. The printouts I take from my Epson Stylus Dx3850 printer are without colour and black print. I’d installed Epson Stylus Dx3850 ink cartridges which were rather old (I’d bought them nearly two years back). Could that be a reason for the faulty printouts? A. Yes, two years is pretty long for ink cartridges to be functional. Please change them before using your printer. Q. Do all printer model drivers offer the option to disable driver updates? A. No. Only some models do. In that case, you’ll have to de-select the updates yourself after the printer is installed and in some cases, set up your firewall to warn or reject system updates waiting to enter your computer. Q. Is the quality of ink in compatible ink cartridges good quality and safe for computers? Q. Do original ink cartridges and compatible ink cartridges look exactly the same? A. They look almost (but not entirely) the same. Q. Occasionally (not often) when I print with my Epson Stylus Dx3850 printer for a long time in a single session, it stops in between. Why does that happen? Does it indicate some problem? A. No, it’s not an indication of any problem. It usually happens when the stops feeding briefly or when the ink cartridge holder stops for a while. It is to make the printing speed slow down a bit so there’s no overheating or damage to the printer. When that happens, stop using the printer and leave it for nearly 30 minutes with the power on and then restart it. Q. I prefer using compatible Epson Stylus Dx3850 ink cartridges (T0615) for my printer. I just received a firmware update message on my system. What will happen if I update it? A. If you enable the firmware update, you will not be able to use compatible Epson Stylus Dx3850 ink cartridges anymore. You’ll have to use only genuine ink cartridges with your printer then.